Long time readers will recall that I am no fan of the funny book webslinger known more eponymously as Spider-Man. Among my core disinterests with the character is his boring costume, which is why I am generally much more drawn to some of the cool redesigns he's gotten over the years (#BenReilly4Lyfe - love that suit! ), one such outfit is this lovely old thing commonly referred to as "Spider-Man Noir." Reluctant hero Spider-Man Noir battles bad guys and mob bosses alike in 1930s New York City. That's surprisingly good given Marvel Legends' typical vague-ery - since I don't really read comics any longer I'm hard pressed to tell you much about the character. I can't really imagine what else I'd need to know about him beyond that bio... my recollection is that he was introduced in/created for the Marvel Noir miniseries in 2009, but only a year later he got some significant hype when he was used to beef up the roster of some videogame that either introduced or cashed-in on the "different Spider-Men in different universes" gimmick to work in him and Spider-Man 2099 to the gameplay. And since Noiry has such a distinctive "goth Rocketeer" costume, which just kind of inherently looks cool, we all ate it up! So, like Spider-Gwen a few years later, this cash-in became a cash-cow and now we get to see him on the big screen (and voiced by Nic Cage). This figure stands a grim'n'gritty 6⅜" tall and is, in effect, a simple but effective body re-use as he is essentially the same body as we saw on the Marvel Legends A.I.M. 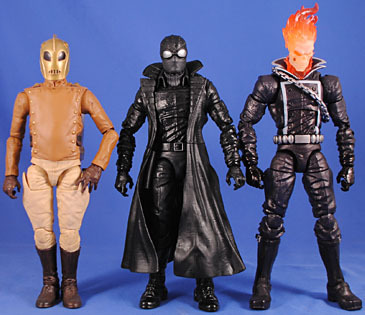 soldier, classic Ghost Rider and modern comic Star-Lord. He does get a few new pieces, the most surprising of which are his boots - now presented with laces and cool fold-over/buckled straps at the top. His collar is also all-new and features the short, folded jacket collar over a pleated turtleneck sweater. Then, of course he gets an all new head, which captures Noiry's mask pretty well. The hood has some nice "hand stitched" lines sculpted on the top, which echo the webs that run over the top of Spidey's classic mask, as well as the pseudo aviator goggles (standing in for the lenses on said mask) and the gray cloth covering his nose and mouth - anonymity ensured! He also gets an all-new belt, which, along with the collar, really does show how intelligently laid out this body's tooling was in the first place; Hasbro very clearly - and smartly - kept some details separate for easy interchangeability, despite the fact that (at least on a single-use mold) it no doubt would have been easier and cheaper to make them part of the initial tooling. 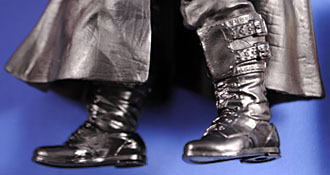 The belt looks more "traditional" than the ones on the other figures that share this body. And this belt even includes a holster for one of Noiry's pistols - nice! 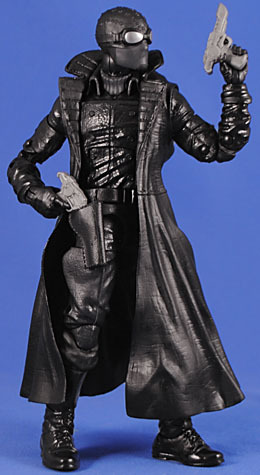 Though, since he does come with two pistols it is pretty conspicuous that there isn't a second holster. His guns are existing sculpts, which look fine but are a bit undersized and a bit too modern and sci-fi to really fit with the retro vibe of the rest of the costume. Unsurprisingly, Noiry gets the same trenchcoat piece we've been seeing since 2009 to complete the look, and since this torso is not as wide as the others the coat has been on, the coat is not as restrictive on the shoulders and hangs better on the body. The one thing with it that does kind of bug me, though, is that they didn't give him new arms - so while the coat does match up with the shoulders pretty well and helps hide how angular they are on the original sculpt, the sculpted textures on the arms are pronounced just enough more that the textural difference between the arms and coat stand out. But maybe that's just me. I dig this costume in that old timey, '30s/'40s kind of way. The torso isn't totally accurate to the original design - the waistcoat should have a single flap that folds over the torso as opposed to this figure having a more Rocketeer-y separate trapezoid buttoned on. 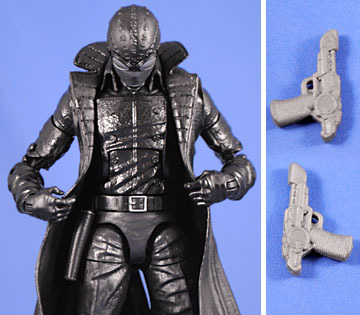 So, in that single-flap regard the Marvel Universe figure is more accurate... but the design still sports two vertical rows of buttons on the front of the jacket, so in that regard the 6" figure is more accurate, so ideally we'd have a mix of the two (or all new tooling here). But the truth is that the trenchcoat covers the torso well enough that it's not a problem, and is really just a thing for unpaid toy reviewers to jibber jabber about in order to meet a word count. All in all, I'm quite pleased with this figure and that they finally got around to him in the 6" line (the 4" version beat him by a year or so). He's much, much cooler than a lot of crappy redesigns that we have and will be forced to buy in order to complete the BAFs - OH! Speaking of which, this sucker comes from the Lizard series and he's packed with Doc Connors' Left Green Hand (to subtly allude to Nick Cave's inescapable hit), which is fully articulated and wonderfully sculpted with some great subtle paint around his sleeve and on the larger scales.